I ended up removing the shoulder pads in order to wear this dress as a regular piece of clothing because they made me look like a linebacker, but that is the only thing I altered.This project made me fall in love with the fashion of that time period. Before I did the research I kind of lumped the 40s and 50s together in my head, but I learned so much and am able to differentiate the two really well now. The look was practical, yet still elegant. It really is a fascinating period in women's fashion, with such a marked change in style from the 30s to the 40s. If you couldn't tell already, I am a bit of a fashion history nerd. 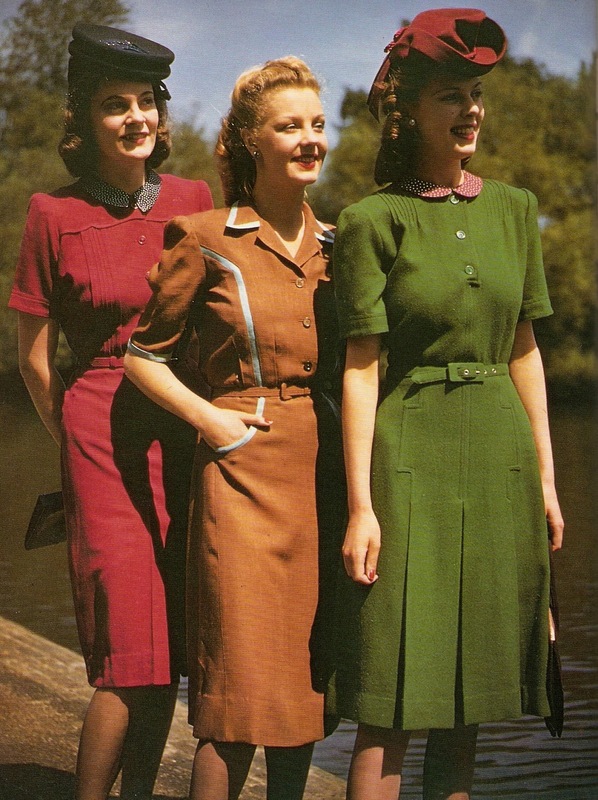 Looking at this picture makes me want to make the green dress too, I love the pleats and collar. Ahh the 40s, how I love you so. I rarely ship at Walmart, but that sweater was actually a good find from there. P.S.you have some awesome pins on that board, I feel special to be on there too.